In 2241 the dominant superpower on Earth, the USAN, successfully concludes the fourth world war. The nation breathes a sigh of relief and looks forward to the resumption of elections. Across the solar system the leading industrialist in the USAN’s small colony on Mars is thinking about independence. When the Martian population votes in favour Mars secedes from the union. It seems to be a fait accompli until it’s suggested that a massive dropship carrying spacecraft, Ephialtes, built to patrol the Earth, could be refitted for interplanetary spaceflight. Maybe the USAN could use its military might to persuade the colonists to reconsider. With an enormous instrument war of heading toward them the Martians resolve to defend their independence. Limited resources force them to rely on wit and ingenuity as they prepare their defences. Can they prevail against the mighty Ephialtes? Political intrigue, heart-pounding action and page-turning drama abound in this gripping opening to the Ephialtes Trilogy. Inspired by the rapidly expanding possibilities offered by self-publication, in 2014 Gavin set about writing his debut novel, Ephialtes. 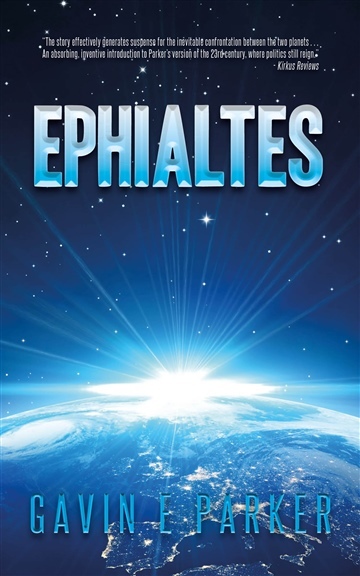 Ephialtes is the first of a trilogy of books chronicling the war between Earth and its former colony on Mars. A series of short stories – Ephialtes Shorts – set in the same fictional universe will be released alongside the main trilogy. Having worked in healthcare, local government and education he has a mildly jaundiced view of the human condition, but still maintains good humour about it. Things could be worse, right?